Here are the ratings for the Fall 2011 season of The Amazing Race. Eleven pairs of people race around the world in an attempt to win a $1 million prize. 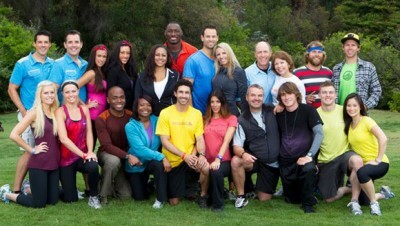 The 19th season of The Amazing Race typically airs Sunday nights at 8pm on the CBS network. Here are the TV show’s ratings for the 2011-12 season, the best way to tell if The Amazing Race is going to be cancelled or renewed for season 21 (the show’s already been renewed for the spring cycle). Check out our CBS ratings report card to see how this show’s numbers compare with the others on the network. Final season 19 averages: 2.88 in the 18-49 demographic with 10.18 million viewers. 3.3 in the demo (+22% episode-to-episode change) with 11.9 million; third in the timeslot. Season average: 2.88 in the demo with 10.18 million. Demo average rank: #2 of 4 non-scripted TV shows on the network (Fall 2011 – Spring 2012). 2.7 in the demo (-7% episode-to-episode change) with 9.58 million; fourth place at 8pm, third at 8:30pm. Season average: 2.84 in the demo with 10.04 million. 2.9 in the demo (+4% episode-to-episode change) with 10.15 million; second in the timeslot. Season average: 2.85 in the demo with 10.09 million. 2.8 in the demo (+4% episode-to-episode change) with 10.24 million. Season average: 2.84 in the demo with 10.08 million. 2.7 in the demo (0% episode-to-episode change) with 10.27 million; fourth in the timeslot. Season average: 2.85 in the demo with 10.06 million. 2.7 in the demo (-10% episode-to-episode change) with 9.73 million; fourth in the timeslot. Season average: 2.87 in the demo with 10.03 million. 3.0 in the demo (+11% episode-to-episode change) with 11.01 million; delayed 30 minutes in some areas. Season average: 2.90 in the demo with 10.08 million. 2.7 in the demo (0% episode-to-episode change) with 9.6 million; fourth in the timeslot. Season average: 2.9 in the demo with 9.9 million. 2.7 in the demo (-4% episode-to-episode change) with 9.21 million; third in the timeslot. Season average: 2.9 in the demo with 9.97 million. 2.8 in the demo (-13% episode-to-episode change) with 9.62 million (delayed 30 minutes due to football). Season average: 3.0 in the demo with 10.22 million. Demo average rank: #3 of 4 non-scripted TV shows on the network (Fall 2011 – Spring 2012). 3.2 in the demo (+7% episode-to-episode change) with 10.87 million; second in the timeslot (started 22 minutes late due to football). Season average: 3.1 in the demo with 10.52 million. 3.0 in the demo with 10.18 million; third in the timeslot. The debut was down by 21% in the demo when compared to last year’s season opener. Reference point: The 2010-11 season averaged a 3.3 rating in the 18-49 demographic and 10.93 million viewers. What do you think? Do you like The Amazing Race TV series? Do you think it should be cancelled or renewed for a 21st season? I totally agree with you, Grandizer. My family love watching The Amazing Race. We’ve watched all the 19 seasons and looking forward for more. The show does not run over, the football game hours before it has run over and CBS can’t get their heads out of their a**es to ever start the series on time. 1/2 – 3/4 of the episodes are normally running late because of football. My DVR records it, yet invariable because the football game ran long, and we must hear all the post game crap, the schedule is always hosed. One of the reasons I find it online and watch it without commercials. Please, cancel this horrible show. It’s tedious and no one likes to spend Sunday night watching petty arguments between couples, friends, & siblings. These people have the opportunity to see incredible sights but they spend their time running and fighting. Why does the stupid show run over? CBS shouldn’t allow this. The shows that follow always get cut off when recorded. The editor should be fired.